The 10th Tandem Club Family Camping Weekend was hosted by the Davies Family at Top End Farm in Little Staughton in Bedfordshire. On Saturday the ride was into Bedford via Great Barford and Willington, where a very late elevenses stop was made at the play park by the Village Hall. After the play stop the ride went off road for a ride along the Ouse following cycle route 51 to Russell Park for a late lunch stop by the swings. As we were near the river in Russell Park and also in Willington, it was no surprise that the sound of several Dragonflies could be heard. The return to the campsite was via a direct route, with an interesting start, navigating the cycle routes and alleys of Bedford to get out to the north side of Bedford avoiding problem roads. A small group left a bit early and took a âDeeTourâ back to Top End. Evening entertainment was provided for the kids in the form of a quiz requiring them to find people who had broken their left leg, had 2 goldfish or anyone who had been to Spain etc. We helped out by dividing our 8 fish unevenly between the 3 of us âº. In addition there was a crisp tasting session won by the Moore family. For Sundayâs ride, Hywel was concerned there could be a problem as he kept warning we might have to walk about 250 yards along an overgrown path on cycle route 51 to avoid a busy main road. The ride was a short ride initially to the Riverside Park in St Neots where Dragonflies could be heard by the lake and then along parts of cycle route 51 through a nice rough stuff section to Grafham water. Hywelâs fears were unfounded as the short section he was concerned about was recently cut, and to quote the late Sid Standard (who originally supplied the Daviesâ tandem), âItâs all rideableâ. I donât think anybody took the long option of riding all the way around the lake. However there was an error in the route sheet which was spotted before everybody ended up going in the wrong direction after the stop at Grafham Water, which again proved to be a natural habitat of Dragonflies. The final leg of the ride was past Little Hey prison and across Staughton Moor where Buzzards and Red Kites could be seen flying. The weekend had a nice casual feel to it with all rides planned to ensure kids were catered for with play parks and there were options on picnicking or making use of cafes or even chippies. Unusually most of the family units rode together, at the start at least, as a couple had a few minor breakdowns, however they were ably assisted by David Holman wielding an allen key and rejoined the main group at the breaks. The numbers attending the weekend were on the low side which was due to the late confirmation of the weekend but for the 10th Family Camping Weekend the organising families of the previous 9 were there to join in the fun: The Moore Family who organised Bletchingdon 2007, the Cunninghamâs who organised Broome 2006, The Bowenâs who organised Moulton 2005 and Cosgrave 2003, we the Dee family who organised 4 events at Market Bosworth in 2004, 2002, 2000 and 1998, and most importantly the Jefferys who organised the first one at Charlbury in 1996. 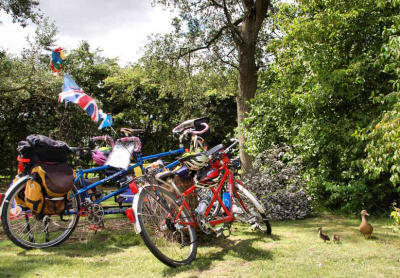 So for all the families out there, if you want a family camping weekend organised, please volunteer and let the Tandem Club Committee know â the earlier it is organised the easier it is. One last thing, Ann, Ceri-SiÃ¢n and I are the only family that can make the claim â âTandem Club Family Camping Weekendsâ â weâve been to them all! For the uninformed â Dragonfly is a type of petrol stove used by lightweight campers which makes a loud noise.